Ideally located in the heart of Antwerp – only 10m walking from the historic city center and easily accessible by public transportation and next to Antwerp Central Station. The Congress Center features 21 halls and rooms. • The Queen Elisabeth hall and Atrium. This brand new auditorium-style concert hall offers 2,020 seats, and is the showpiece of the Flanders Meeting & Convention Center Antwerp. The atrium is perfectly shaped for your exhibition needs. 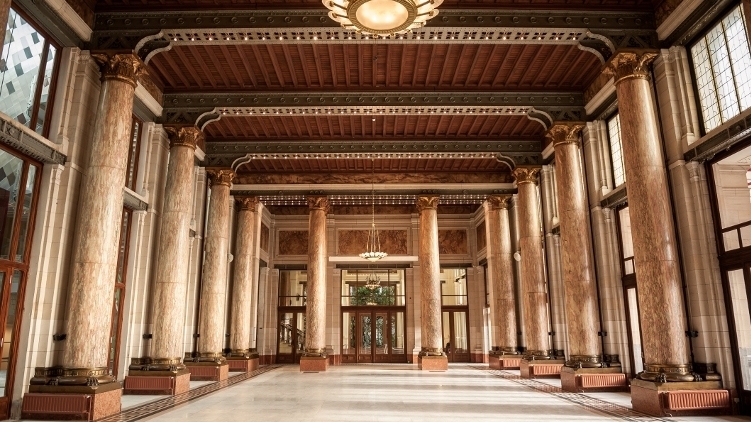 • Featuring different kinds of marble, high ceilings and Art Nouveau architecture, our historic halls are the perfect setting for all your events. 12 different breakout rooms with capacties ranging from 20-350 people. • The Carnot Wing ‘Historisch meets modern’. The 8 modern rooms offer an executive feel of timeless luxury. These rooms look more modern than the rooms in the historical wing, however, they did keep their original and authentical characteristics. The rooms in the carnot wing have a capacity ranging from 200-400 people.